1977: I earn a Ph.D. in applied elementary high-energy particle physics. Get a post-doc position and move to the United States. Work at major U.S. particle accelerators for a year. Leave academic research forever. Since 1978 — that’s 41 years! — every job I’ve had didn’t exist a few years earlier. 1978: I join the management of Solar Alternative, a solar energy manufacturing business founded the previous year. Five years earlier, there were no such businesses in the United States. 1983: I start teaching computer science using personal computers in the classroom. IBM introduced the PC in 1981. 1984: I begin IT consulting for clients using personal computers. Businesses didn’t start using personal computers until the early 80’s. 1992: I organize a conference where there are no expert speakers available (it’s a new field, there are no experts). Invent a way to make the conference successful based on the collective needs, wants, and experience of the attendees. (The conference has run annually for the last 27 years.) This is something new. Organizations hear about this and ask me to design and facilitate their conferences. 2009: I self-publish Conferences That Work: Creating Events That People Love. (Five years earlier, self-publishing was a minor industry for vanity projects. Now it’s the most common way authors publish.) I quickly discover the size and interest of the meetings industry. In demand, I become a meeting designer and facilitator of participant-driven, participation-rich meetings. Yet another career that had not existed before. My parents once suggested I become an accountant. I politely declined and continued studying physics. I have nothing against conventional careers, but my life hasn’t turned out that way. If I had to guess, it probably won’t. And it probably won’t for you either. 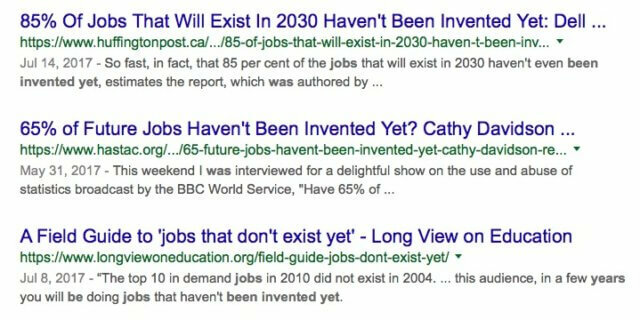 Has the job you’re doing now just been invented? Share your experience in the comments below!